Minneapolis became noted as a center for rhythm and blues (R&B) in the 1980s, when the multi-talented star Prince rose to fame. But the twin-cities region had long been known for giving birth to notable modern folk music, gospel, blues, alt rock and jazz artists. Dee Miller grew up in Saint Paul Minnesota, singing along to her favorite vocalists and was a member of many local bands earning the title The Duchess of the Blues from the Minnesota blues community. The self-proclaimed barrelhouse singer formed her own band in 2004 and in the fall of 2018 the Minnesota Blues Society inducted Dee Miller into the Minnesota Blues Hall of Fame in the category of Performer. 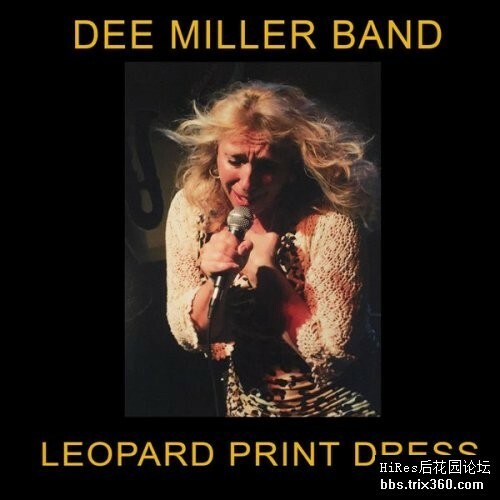 Their third album, Leopard Print Dress, was recorded at the Villa Studios and features ten tracks a cross section of house rockin blues heavy duty soul and dance party R&B that showcases the muscular abilities of this tight hard-working band. The sharp originals and creative covers reflect the variety of blues, rock, and R&B deep-cuts in the group s repertoire. Inspired by wild nights in steamy nightclubs the rousing Hot And Sweaty, open the set with dance floor filling swing and sizzle. Miller proudly carries the torch for Etta James on the blazing cover of Strongest Weakness, with her powerful, deep, earthy voice bridging the gap between R&B and rock n roll. John Pinckaers sits in on piano for the gospel-fueled reading on the Eagles classic Take It To The Limit. Craig Clark shares the lead vocals for the title track Leopard Print Dress, which won the Minnesota Blues Hall of Fame award in 2017 for Best Song. The four on the floor blues rocker was cowritten with Jimi Primetime Smith and features a greasy slide guitar solo that has become Miller s trademark anthem. The house party really gets rolling for the horn-infused boogie woogie Back In The Saddle, then Clark steps up on the soul blues burner Last Two Dollars, delivering powerful vocals and a ripping lead on the Jonny Taylor hit that has become a staple of the club scene. Steve Boom Boom Vonderharr added his hot blues harp to the bump and grind shuffle I Sing The Blues, and Toby Marshall lays down sweet Hammond B3 on the lovely cover of Midnight In Harlem, with Dylan Salfer tackling the daunting slide guitar part written by Derrick Trucks over a new double chorus outro. The Band gets funky on rousing take of Albert Collins classic Black Cat Bone, highlighted by groovy keyboard from Jesse Mueller and icepick guitar from Clark. Miller dedicates the album closer Steppin , to all her girlfriends out there who ve been done wrong then preaches the blues the way it is supposed to be; down and dirty, raw and live off the floor. The Dee Miller Band are poised to make some bold impressions and tell the world what the Twin Cities has known for some time; The Duchess and her boys are here to tear the house down.